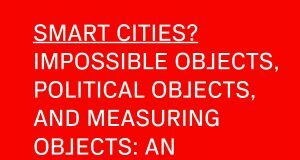 I spoke about “Interfacing Urban Intelligence” at the “Code + the City” workshop, which took place in Ireland on September 3-4, 2014. My talk was drawn from my article of the same title, which I published in Places last year. You can watch a video of my talk here. I have a habit of giving talks with wet hair, it seems. See also the videos of my fellow panelists: Rob Kitchin, Adrian Mackenzie, Sophia Maalsen and Sung-Yueh Perng.